to view and photograph nesting birds. in to the Rookery at sunset. the pair's nest at the Rookery. that nests at the Rookery. Alligators patrol the Rookery pond and keep predators such as raccoons away from nesting birds. The Venice Area Audubon Rookery, internationally known to bird photographers, is freely open to all visitors from dawn to dusk every day of the year. The Rookery island’s deep lake is small enough so that from the shaded pavilion benches you hardly need binoculars for a clear view of the birds. 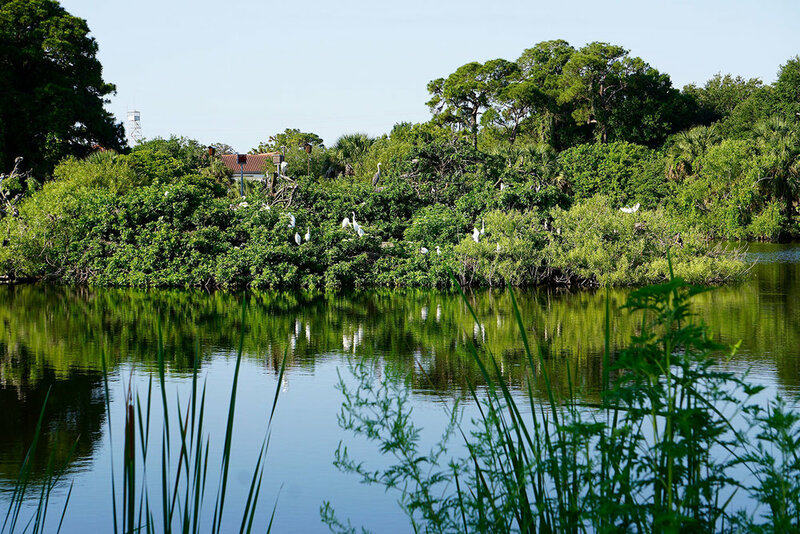 Tangled invasive plants have been replaced by Florida-friendly vegetation so you can easily walk around the edge of the lake and watch bird activity on all sides of the island. During nesting months (usually beginning in December and lasting through May), daytime activity includes Great Blue Herons, Great Egrets, Anhingas, Snowy Egrets, Cattle Egrets, Glossy Ibises, Green Herons, Tricolored Herons and Black-crowned Night-Herons busily building or enhancing nests, courting, incubating eggs, and raising chicks. Nesting season is busy but the Rookery has avian visitors year round. Nesting species and others (such as White Ibises and Little Blue Herons) flock in great numbers to the island each evening at sunset to roost safely for the night. Alligators patrol the lake, keeping mammalian predators from preying on the island’s birds. Optimum times to see or photograph the most birds are early morning or late afternoon. The best vantage point at sunset is from the west side, across from the pavilion. You are welcome to picnic here, but fires are not allowed. January through April, VAAS occasionally staffs the Rookery with volunteers who bring extra binoculars, a spotting scope, and bird field guides for anyone to use. If you wish to help staff the Rookery, email or call us at 941-496-8984. The Venice Rookery is an all-volunteer project. A secure donation box at the Rookery is monitored frequently. We invite you to use it. All contributions support our work, including bringing hundreds of second-grade school children to the Rookery each year. Click here to download a checklist of birds seen at or near the Venice Rookery. Please let us know if you observe other species there! Watching hundreds of bats emerge from their houses at the Venice Area Audubon Rookery has become a popular evening activity. Sarasota County installed four bat houses near the Rookery and regularly monitors them for activity. They are located just left of the Rookery pond. Two species of bats have been identified using the four bat houses: Brazilian or Mexican Free-tailed Bat and the Evening Bat. From the North: Take U.S. 41 (Tamiami Trail) south, 1/2 mile past Rt. 776. Turn right onto Annex Road at the Anderson Sarasota County Administration Center. Follow Annex Road past the Venice Audubon Center to the Rookery on right. From the South: Take U.S. 41 (Tamiami Trail) north, 1/8 mile past Jacaranda Blvd. (Walmart on south corner). Turn left onto Annex Road at the Anderson Sarasota County Administration Center. Follow Annex Road past the Venice Audubon Center to the Rookery on right. Do you enjoy taking pictures of wildlife in their natural habitat? Watch this video for some easy to follow tips to make your experience with nature safer and more fulfilling.